One constant in our dynamic modern world is that technology will continue to improve and change. As a result, small businesses must always keep a close eye on the new developments affecting them. Your company will benefit by recognizing and realizing how best to take advantage of the latest technology trends. Cloud Computing options for data storage, fast processing, and for applications and solutions are becoming more cost-effective with greater functionality. One respected survey revealed that in 2016, 85% of small businesses were using a cloud provider for data storage. As the user-friendliness for all the different cloud options improves and costs continue to decrease, using the cloud for a variety of business needs will become increasingly more attractive for small businesses. As baby boomers rapidly exit leadership and staff positions and start to retire, the workforce is becoming increasingly filled by millennials who have a different outlook on the use of technology and the work-life balance. In addition, new tech companies and other entrepreneurial forces are increasingly being led by young minds who will increasingly influence the working environment. 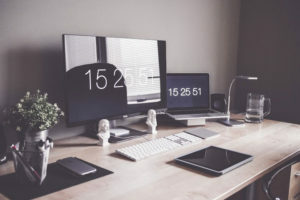 Small businesses will have to expand upon both remote working and Bring Your Own Device (BYOD) options as young workers demand more flexibility along with access to the technology they are most comfortable using at work and in their free time. The overall shift toward a working preference with tablets or mobile phones will also continue to grow as millennials exert their influence. Small companies should also pay more attention to using and developing mobile apps for their business purposes as the use of mobile phones and devices continues to expand at a rapid pace. As more companies move more and more functions to the cloud and data-based solutions keep getting more complex, the demands on your network and internet connection will continue to increase. The latest technology is useless if you can’t access it easily or use it effectively, so a fast and reliable internet connection will be even more important next year and beyond. As the use of the cloud increases and workers more frequently access their own devices and work remotely, cybersecurity challenges will increase as well. Every year cybersecurity threats to business become more varied and more difficult to stop as cybercriminals continue their never ending quest to exploit lax security for financial gain and mayhem. As a result, small companies should treat cybersecurity as one of their essential business functions and invest accordingly in cybersecurity solutions, protective hardware such as firewalls, and personnel training and education. Every company should make sure they invest the time and effort to formulate comprehensive cybersecurity and device use policies and to educate their employees about them. In addition, new and improved payment security tools will be available. Small companies selling their products and services online should not try to cut costs in this important area. Artificial Intelligence (AI) has started to move from science fiction into reality as more businesses are using machine learning to enhance, personalize, and improve the customer experience. For example, some companies have started using intelligent applications, which are software platforms that use AI to increase the productivity of users. Adaptive security architecture, where smart computers, devices, and security tools learn and adapt to better protect themselves from cyberattacks, will continue to improve as well. In addition, the development of “intelligent things,” such as smart appliances, vehicles, drones, and household items that work with AI platforms will continue to evolve. Similarly, the many billions invested by firms into Virtual Reality (VR) and Augmented Reality (AR) has started to pay off for companies large and small. Firms of all sizes are leveraging this technology to introduce their brands to potential customers, to train employees, and to improve their products or services with their current clients. Small businesses should pay careful attention as these powerful technologies continue to improve. Small businesses have been using social media to communicate with their clients for a while, but their role as key marketing influencers will grow next year and in the future. All of the big social media platforms (LinkedIn, Facebook, Twitter, Instagram, Snapchat) are increasing their targeting of small businesses. They are offering new advertising and monitoring opportunities so that small businesses can gain new customers and learn more about the buying behavior of consumers. The importance of using social media as a marketing influencer will continue to grow as millennial customers become a more dominant force. This demographic is more accepting of promotional methods that focus on informing and involving them as opposed to directly selling to them. Using the new tools available on social media will also allow small businesses to subtly promote their products and services to niche and underserved markets. As consumers increasingly desire on-demand access to products and services with the ability to purchase them with ease from their mobile devices, the opportunities for small businesses to use E-Commerce will continue to grow. Almost any product or service can be sold online and small businesses should utilize the ever-increasing power of the internet to market, sell, and deliver their offerings to new and current customers. As E-Commerce grows, the importance of subscription-based services will increase as well. Customers increasingly prefer the simplicity of a monthly recurring fee with an automated payment to regularly purchase almost any type of good or service. Small businesses will move toward this model as they realize the benefits of being able to plan their sales projections and budget more accurately as more of their revenue comes from recurring payments. In short, 2017 is shaping up to be another exciting year of interesting technology developments that small businesses should take the time to understand and incorporate into their planning and operations. If your company takes the time to do this, it will benefit both your customers and your business. For assistance with understanding and incorporating the benefits of the latest technology trends, please contact us here at Network Depot.